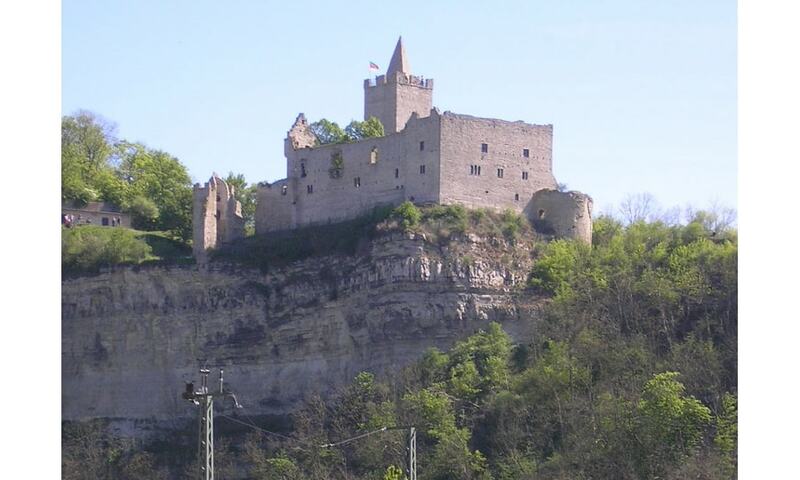 Rudelsburg Castle lies on the east bank of the river Saale atop a rocky shell limestone ridge, approximately 85 metres above the river and above Saaleck, a suburb of the town of Bad Kosen. The Rudelsburg was built in the Middle Ages by the Bishop of Naumburg and served to secure trade routes such as the Via Regia through the Saale Valley. In the early 19th century the Rudelsburg became a popular tourist destination thanks to the romanticisation of mountains and the rise of hiking as a pastime. It was considered one of the most beautiful of the castles on the river Saale and exceeded mere regional fame from 1855 onwards. The Rudelsburg still represents a particular attraction and lies on the southward course of the Romanesque Road, a holiday route in Saxony-Anhalt.